Most GUI windows nowadays, ranging from web browsers to editors and data-entry windows, have a small status-bar at their bottom. Statusbars are a great way to convey non-critical information to the user, in a non-intrusive manner (without popup windows). 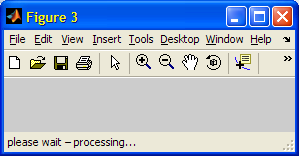 Matlab windows are no exception: they too have status bars which are sometimes used by internal Matlab functions. 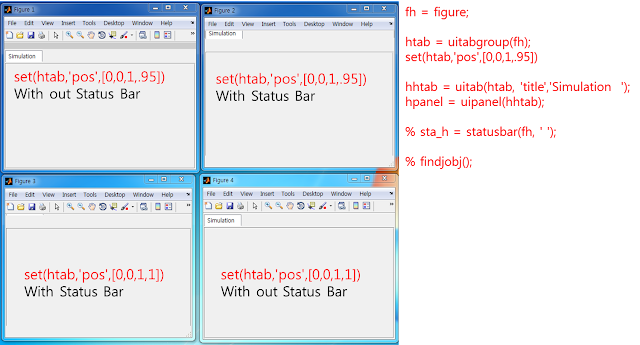 Unfortunately, there is no documented way to modify Matlab statusbars. In this post I will demonstrate the undocumented way of setting status-bar text, which is probably the most useful use-case. In next week’s post, I will expand this to include more complex customizations, such as dynamic progress-bars or a corner grip. Note: Users interested in non-intrusive status-bar messages, may also be interested in another non-intrusive messaging mechanism which I have described some months ago: Setting system tray popup messages. Basically, we try to get the Java reference to the Matlab desktop, see if it has an open window frame and if so then we use its setStatusText() method to display a text message; if not then we display the message in the Command Window (which is probably a non-window console). Unfortunately, nothing prevents the user from placing the label anywhere in the figure, and also from having multiple such labels at once, adding to the confusion. The result is inconsistent with normal windowing practices, and this is probably the reason that MathWorks have grandfathered these functions in Matlab 7.4 (R2007a). It would be much more logical for Matlab to have the statusbar accessible via a figure property, and perhaps this will happen in some future version. This is about uicomponent (e.g. JButton). How does one set button’s Border property so button’s appearance is isolated from PC desktop appearance Windows XP vs. Classic styles? Not sure how to proceed to lock onto one style or the other. My uicomponent utility (and similarly Matlab’s javacomponent function) returns the Java reference. This can be used to update the component’s Border property. The default component border is set at creation-time based on the currently-active Look-and-Feel (L&F), but can always be overridden. You can’t pre-lock a property value. But you can modify it immediately following creation, which is essentially the same thing. Another (plaf?) question: after a jbutton is pressed, there is a dotted rectangular line on the button icon indicating the latest focused object. Could this line be removed or set to the same background color so it is invisible? If you don’t wish the control selection to become visible, perhaps you should simply set the control to be non-focusable or disabled? First of all, congratulations for your excellent site. I looked for a place where to post this idea, but I didn’t know where to. 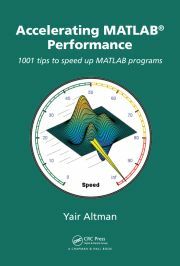 I do not like Matlab uitable, and in GUI I use the java table. However, java table is difficult for me to program, specially the Callbacks when someone edits a cell value. Is there a way I could use the table in the ArrayEditor to edit data from a GUI?. The table in the ArrayEditor looks like the java table, and has many features when right-click, and also updates the value of the matrix when I edit a cell value. My idea is to have a button in my main GUI that says “Edit”. When clicked, it opens the ArrayEditor in a separate window. This window should also have buttons Accept, Cancel. In Accept, it collects the data from the ArrayEditor and closes window. When cancel, it simply closes the windows. To put it in a nutshell… is there a way to put the ArrayEditor table in a new figure window, with room left for adding buttons? (I can do all the rest). Thank you very much and congratulations again. You may find my Java-based data table utility (on the Matlab File Exchange) useful as a general-purpose sortable Java table. My PlotData utility also uses a Java table, in this case to display the raw data of figure plots. With the knowledge that you have displayed in your question, it should be fairly easy for you to modify the code in these two utilities to fit your purposes. can the same thing (Progress bar on status bar) be done for the simulink model editor window’s status bar? Is it some incompatibility issue? @Sandor – the new statusbar simply pushed the figure contents upward a few pixels. Your tabs were probably right at the top of the figure contents, and so they were pushed upward beneath the toolbar and effectively became hidden. I read “Sandor Toth” says. but really I don’t know. I tried Statusbar with tabgoup. but tabgroup title bar was up. 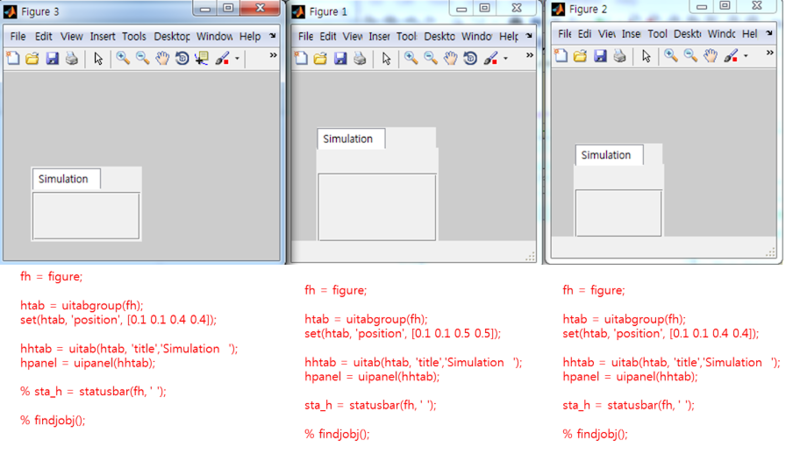 and panel is normalized in tabgroup. But It’s different between it ans with out statusbar. I can’t say detail about this. Can you see my script?? left side is without statusbar. right side is within statusbar. I hope you see this picture. The picture is with run script. I’m Sorry for reply again. It worked, but it isn’t I want to. Is it the best way for uitabgoup?? I tried 4 way show uitabgroup within Statusbar. And I also used findjobj() function. uitabgroup has JPanel. I think the JPanel was pushed by statubar. So… If I get Handle of JPanel in Matlab, I can move uitabgroup.. maybe..
Is it possible to change the position of the status bar to have it integrated in the GUI ? @Raphael – the status bar is always placed at the bottom of the figure, it cannot be moved. This is the convention in all Windows. Have you ever seen a status bar NOT at the bottom of any window??? I guess I was more thinking about the progress bars in a window, like installation processes. The name 'MouseClickedCallback' is not an accessible property for an instance of class 'com.mathworks.mwswing.MJStatusBar$1'. I’m guessing they have changed the way one sets up a callback for a mouse click on the status bar. Could you let me know how this is done these days? Yair, How can I do that the background is transparent? Thanks. Thank you Mr. Altman for sharing with us the result of your research. No appropriate method, property, or field fFigureClient for class com.mathworks.hg.peer.HG2FigurePeer. And the error that is have is now : Attempt to reference field of non-structure array. It is because JRootPane is empty. The jRootPane is still empty, this is why the call ”jRootPane.setStatusBar(statusbarObj);” creates the following error : Attempt to reference field of non-structure array.